I read Octopus Librarian's excellent post on work / life balance and thought about all the things I've said 'yes' to and why, since graduating six months ago. That made me remember all the other times I've started something new, and how useful it was to say yes. Like when I went to teach English in Austria with no German language skills whatsoever. 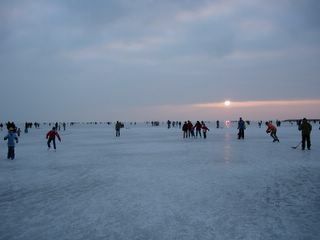 My Austrian colleagues obviously felt sorry for me because they invited my to everything going - I joined a rock-climbing class, took up indoor hockey, went to art shows and cafes in Vienna, learnt to ice-skate on a frozen lake, and babysat Austrian children. 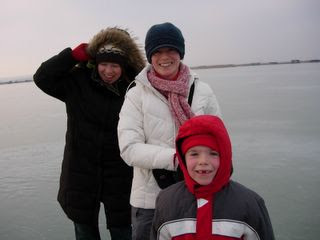 Me in the middle, on a frozen lake. Hungary in the distance. I said yes to all the invitations, stumbled along with the language, and my confidence grew - this despite the fact that I'm a total introvert. But before long I felt confident enough to say no to the activities that I tried and didn't like (out of all of the above, the only one I didn't like were the Viennese cafes - too smoky! ), or when I felt like I was too busy. I even said it in German. My point is that participation really accelerates learning and confidence. Some of these I can do in work time, others I do in my own time. None of them cost me (personally) any money. And I'm really enjoying them all, and learning heaps! None of them stress me out (well... wait for assignment time, um..) and so far, nothing is infringing on my life outside of work. I'm more wary of signing up for things that are on-going (i.e. no end in sight... committees, minute taking, etc.) or things where I won't learn anything new (e.g. volunteer cataloguing). These are the criteria I use to make a yes or no decision regarding whether to take on something new.